On October 28, 2014, Metropolitan Hilarion of Volokolamsk, head of the Moscow Patriarchate Department for External Church Relations, met with the head of the Coptic Church, His Holiness Patriarch Tawadros II, at the DECR. The official delegation led by Patriarch Tawadros included Metropolitan Bishoy of Damietta; Bishop Rafeile of Central Cairo, general secretary of the Coptic Church Holy Synod; Bishop Kirolos of Milan; Bishop Serapion of Los Angeles; Bishop Angelos, vicar-bishop in Great Britain; Rev. Angelos Ishak, Patriarchal secretary; Rev. Poules Halim, Patriarchal press secretary; Sister Edrosis Girgis, mother superior of the St. Theodore Convent in Cairo; Prof. Dr. Ishak Ibrahim Agban, Port Said Theological and Pastoral College. Metropolitan Hilarion warmly welcomed the high guest, noting that it was the first visit to be made by the Head of the Coptic Church to Russia for over 25 years. At the request of His Holiness, Metropolitan Hilarion told him about the history and today’s work of the Department for External Church Relation and other synodal structures of the Russian Orthodox Church. The high guest showed a lively interest in matters concerning the development of church life in Russia. A considerable attention during the talk was given to the situation of Christians in the Middle East. “With regret and profound distress we are following the developments in some countries of the Middle East and North Africa, where Christians have been subjected to full-scale persecution and, I would say, genocide. Regrettably, in various countries of the region, the events have developed according to the same scenario: first, the existing regime is overthrown with the help of external forces allegedly in the name of freedom and democracy only to be replaced not by freedom and democracy but by chaos and tragedy for millions of people. The most extremist elements hold up their heads and commit horrible atrocities. Their victims are primarily Christians. We are aware of the tragedy of Christians in Iraq; there are almost no Christians left in Libya. It is already for the third year now that the grave situation remains in Syria”, Metropolitan Hilarion said. As a result of the developments in Egypt, he continued, about one hundred thousand Egyptian Christians-Copts have had to leave their country. “We welcome the steps taken by the present Egyptian authorities to normalize the situation in the country”, he said. The Russian Orthodox Church invariably expresses her deep solidarity with Christians in the Middle East, the DECR chairman stated, noting that “our Church will continue to raise her voice in defence of the Christians who are subjected to persecution”. At the same time, His Eminence noted that the protection of the Christian population in the Middle East is one of the important vectors in the foreign policy of the Russian State. “We thank the Russian Church for her position with regard to the situation of Christians in the Middle East and North Africa”, Patriarch Tawadros II responded. He said that the cooperation between the Russian Orthodox Church and the Coptic Church, including in the sphere of peacemaking, can become a good example for the whole world”. 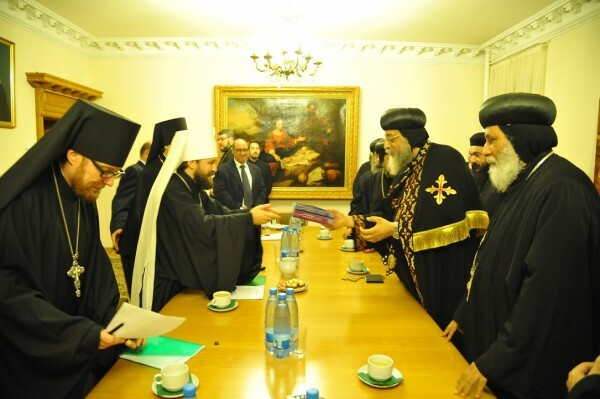 The sides discussed prospects for the development of dialogue between the Russian Orthodox and the Oriental Churches. They also touched upon the humanitarian situation in Ukraine.